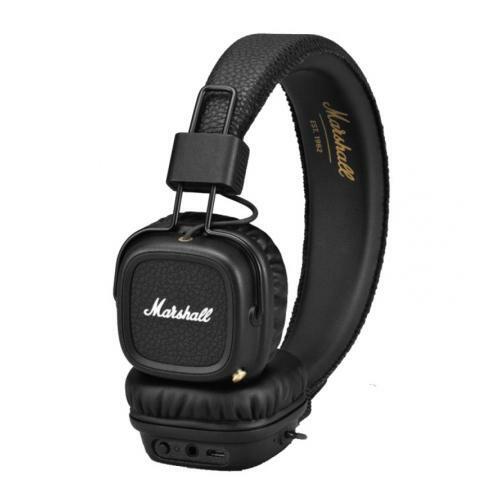 The Major II Bluetooth® gives you the freedom and convenience of a wireless headphone combined with over 50 years of tried and true Marshall performance. Seamlessly connect to your listening device with the latest in aptX™ for Bluetooth Technology and listen to 30+ hours of music.Not only can you blast your favourite tunes in CD-like audio quality, aptX also minimizes audio/video syncing issues, allowing you to watch movies without experiencing horrible lip sync.The double-ended coil cord with mic & remote is completely detachable and compatible with any music player that receives a 3.5mm jack.When listening to music wirelessly, you can use the empty 3.5mm socket to share audio with someone else. With the analogue control knob you can play, pause, shuffle and adjust the volume.Phone functionality is also included so you can answer, reject or end a call with a few simple clicks. Turn on, tune in and rock out to the customized drivers, which deliver a sound that it timeless and sure to be remembered.